The news of the birth of Princess Charlotte Elizabeth Diana of Cambridge has been widely welcomed, especially by those of us who particularly wanted a girl. This little girl will be the first princess born under the revised rules which mean that she will not lose her place in the succession to a younger brother (should she have one). 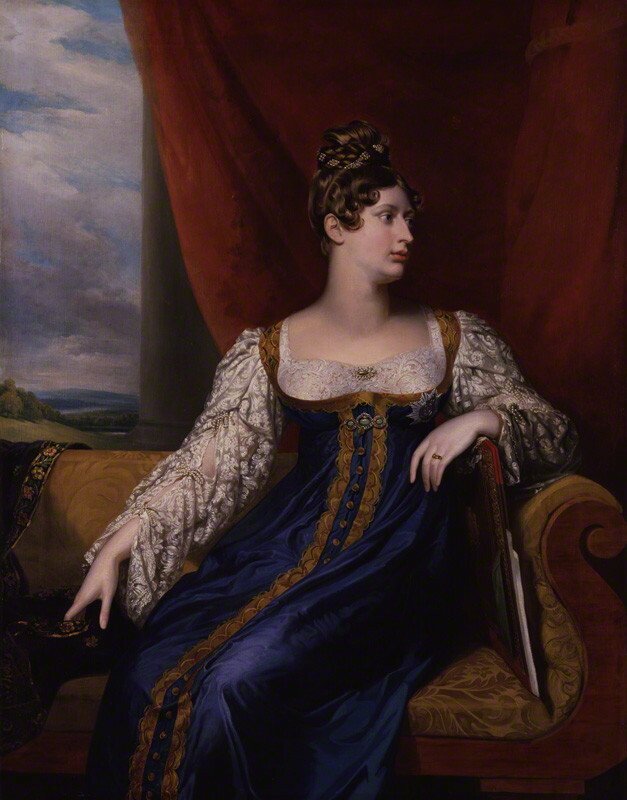 The birth has also aroused interest in former Princess Charlottes, most notably Princess Charlotte Augusta of Wales (1796-1817) the only child of George, Prince of Wales (later Prince Regent, later still, George IV) and his wife, Princess Caroline of Brunswick. They were probably the most unsuited couple in the whole long, and frequently troubled history of royal marriages, and Charlotte was the unfortunate product of this misalliance. For her short and troubled life see here, and here, and here. 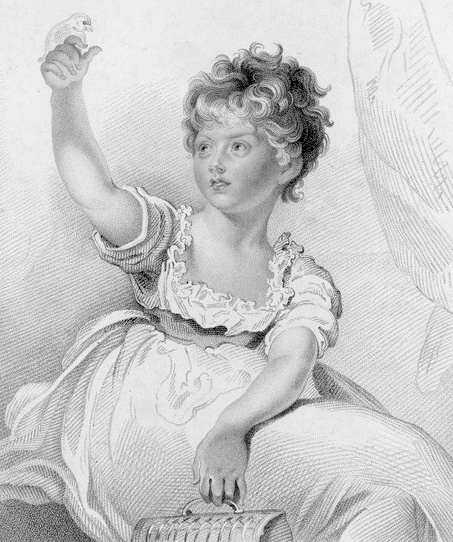 Charlotte in 1806, aged eight; after Sir Thomas Lawrence. Public domain. From the start the child was the focus of intense interest, particularly when the irrevocable breakdown of her parents’ marriage became public knowledge. This meant that unless the prince was able to divorce his wayward wife and marry again, there would be no more legitimate children, no son to displace Charlotte. From an early age therefore, the heiress presumptive to the throne was seen as a future queen. Five years later the picture had darkened, and the royal family was locked into a dispute about Charlotte’s education. Her grandfather, George III, was insisting that her education ‘cannot be that of a female, but she, being the presumptive heir of the Crown must have one of a more extended nature’. He proposed that she should live at Windsor with him rather than with her father. But to complicate matters, 1804 was the year in which the king experienced his third attack of madness, and, even without this disaster, his relationship with his son was poisonous. Charlotte’s father and grandfather were therefore locked into a dispute about her education. The dispute was resolved at the end of the year when it was agreed that Charlotte should spend half the year at Windsor with her grandfather, and the other half at Warwick House in London, a rather gloomy building that adjoined Carlton House. The great casualty of this arrangement was Lady Elgin, who was replaced by the more assertive Lady de Clifford, and poor Charlotte was deprived of the woman who had been her substitute mother. The Bishop of Exeter, John Fisher, was appointed preceptor, with overall responsibility for Charlotte’s education. Much of this was reported in the newspapers and was the subject of a great deal of gossip. This was picked up by Hannah More, whose friend, Ann Kennicott, the widow of the Hebrew scholar, Dr Benjamin Kennicott, was living at Windsor. What More heard appalled her, especially when the unfounded rumour reached her that the child’s governess was to be the prince’s friend, the notorious Duchess of Devonshire. She decided to step into the situation herself. Clearly she could not put herself forward as a governess – she was too old and too humbly born – but she was well known as the author of Strictures on the Modern System of Female Education. She had firm, Lockean views on the importance of education in forming the character – and whose character could be more important than that of the future queen? Dr Robert Gray, the biblical scholar and prebendary of Durham, was urging her to write a pamphlet on ‘the education of a certain royal personage’, and by September 1804, while the conflict around Charlotte was still raging, she had bitten the bullet and was in the throes of her two-volume book, Hints Towards Forming the Character of a Young Princess. The book was to be published anonymously, and few people were in on the secret. Ann Kennicott was one, William Wilberforce another. In September 1804, while he was at Lyme on holiday with his family (the occasion when he might have met Jane Austen) she began sending drafts of the manuscript. She had two main anxieties: that Wilberforce might not like the book, and that the carter would lose it. Fortunately the manuscript reached its destination safely and Wilberforce approved, professing himself in awe of her prodigious memory – that she could refer so readily to books that he know she did not have immediately to hand. At about the same time Ann Kennicott was tut-tutting about Charlotte to Hannah More. In view of the erratic and selfish behaviour of both her parents, it is hardly surprising that the young princess was inclined to kick over the traces. Then, in 1816, Charlotte’s life took a dramatic turn for the better when she married the German Prince Leopold of Saxe-Coburg in May and moved with him into their new home, the Palladian mansion, Claremont House in Surrey. The news of her pregnancy was greeted with delight. Then in early November 1817 she went into a very long but comparatively painless labour, supervised by the renowned accoucheur, Dr Richard Croft. On 5 November she gave birth to a stillborn son, and early the next day she herself died from causes that have never been properly explained. Charlotte’s sudden and unexpected death was a ‘Diana’ moment, experienced by many as a personal grief. Wilberforce reflected a view widely held in Evangelical circles. ‘The loss was most deeply felt; their [Charlotte’s and Leopold’s] life had been truly exemplary – charitable, unostentatious kindness to all the poor round Claremont.’ R. I. and S. Wilberforce, The Life of Wilberforce (London, 1838), vol. 4, p. 362. Her own intense grief comes out in her letters to her young friend, Marianne Thornton (now in the Cambridge University Library). She could not stop thinking of the ‘lovely happy Princess’ and her ‘desolate husband’. After a stormy childhood and adolescence she seemed to have found a pilot to guide her – and now she was dead. More, an intense, even bigoted, Protestant, found herself wishing she was a Catholic, so that she could pray for Charlotte’s soul. ‘It seems comfortless that after one has watched over them and offered up petitions for them that in the moment of the greatest interest, that if their dissolution, prayer must cease … and what was duty one moment is become unlawful in the next. Over the next few years, however, More came to see the princess’s death as tragic but providential. Charlotte’s politics were not hers: she had been a Whig and Hannah More was an increasingly vehement Tory. By this time Charlotte’s cousin had been born, the future Queen Victoria. 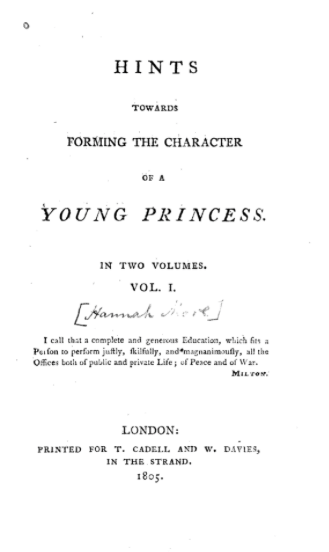 Wilberforce was to call on the little princess and find her ‘a fine animated child’. (Life of Wilberforce, vol. 5, pp. 71-2). At the end of Hannah More’s life, when it was a near certainty that Victoria would succeed to the throne, she sent her mother, the Duchess of Kent, a copy of the Hints to Princess, as an indication that she believed that her hope of a virtuous and patriotic female sovereign would at last be fulfilled. Five years after More’s death, her biographer, Henry Thompson, was given permission to dedicate his Life (published in 1838) to the young queen. This entry was posted in Uncategorized and tagged Ann Kennicott, Clapham Sect, Hannah More, Hints Towards Forming the Character of a Young Princess, Marianne Thornton Younger, Princess Charlotte Augusta, The Regency, William Wilberforce. Bookmark the permalink.